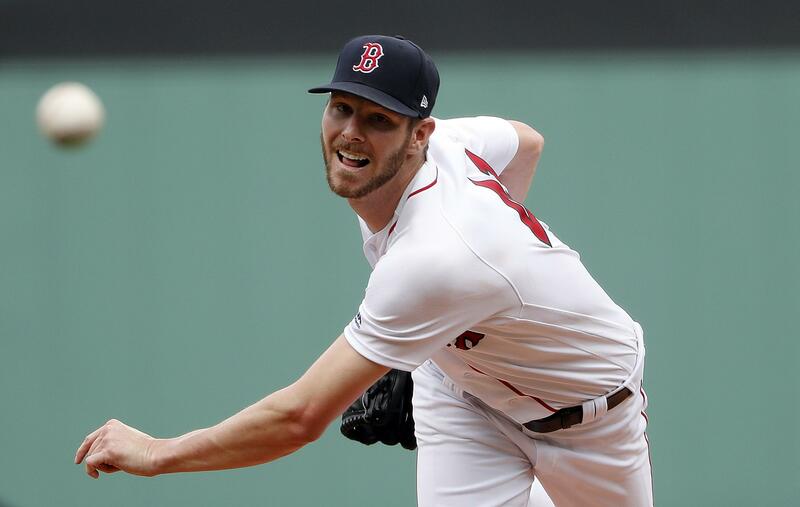 BOSTON – The obvious realization came in the first few at-bats of the game: This wasn’t going to be one of those days where Chris Sale gets beat. It was going to be a long, difficult day for Seattle hitters. The Mariners’ only hope for victory would be to match Sale’s dominance and somehow pull out a victory at the end against the Red Sox bullpen. But neither happened Sunday in a 5-0 loss to the Red Sox at Fenway Park. Sale dominated for seven scoreless innings while Boston built a sizable lead against Mariners starter Marco Gonzales. As Sale painted the edges of the plate with his high-90s fastballs and dropped in nasty, almost unfair sliders, the only questions that remained were: 1. Would the Mariners score against him? 2. How many Seattle hitters would he strike out? It was a comfortable enough margin that the Red Sox didn’t have to push Sale into the eighth. He’d thrown 93 pitches, allowed just four hits, struck out 13 batters and walked one to improve to 7-4 on the season. Sale has allowed two runs or fewer in each of his past four starts, posting a 1.29 ERA. In nine career starts vs. Seattle, Sale is 6-1 with 1.95 ERA and 96 strikeouts in 69 1/3 innings. Only one Mariners hitter made it past second base. It came on Cruz’s triple over the head of right fielder Mookie Betts in the third inning. Over the first five innings, Sale struck out 10 batters and allowed six balls to be put into play. From the third through the fifth inning, he struck out eight of the 10 batters he faced. The few times the Mariners got runners on base against Sale, he seemed to get stronger. Seattle’s best chance at a run came in the sixth. With Dee Gordon on first base, Mitch Haniger sent a hard line drive to right field. But Betts made a twisting catch at the wall to end the inning. Sale’s 93rd pitch of the game was a riding 100.5 mph fastball that Mike Zunino had no chance of hitting. He waved at the nasty pitch, striking out for the third time in the game. For four innings, Gonzales was matching Sale’s dominance. A fellow lefty that doesn’t have any of the velocity or violent stuff of Sale, Gonzales was pinpoint in his command and attack against the full complement of Boston’s lineup. Gonzales allowed just one hit over four scoreless innings, while striking out six batters. But his outing fell apart in the fifth. He allowed a leadoff double to Xander Bogaerts, a single to Eduardo Nunez and another double to Rafael Devers, which plated the first Boston run. The Red Sox added a pair of sacrifices flies in the inning to make it 3-0. But Gonzales hinted at something a little more nefarious than good at-bats or changed approaches. Did he think he was tipping pitches or was he referring to sign stealing by the Red Sox, which they were caught doing last season? A 1-0 deficit vs. Sale is workable. A 2-0 deficit makes you hope to get him out an inning early and then beat the bullpen. Anything more than that, a comeback becomes borderline impossible. And the Red Sox lead continued to grow against Gonzales. Mitch Moreland smashed a two-run homer to center to push the lead to 5-0 in the sixth. Gonzales finished the frame, but his outing was done. After the first four scoreless innings, he’d allowed five runs in the final two. He gave up a total of seven hits with five strikeouts. Published: June 24, 2018, 2:56 p.m. Updated: June 24, 2018, 6:21 p.m.